I can remember when I was young we did not have a lot of money. I am not sure that we realized that. At Christmas we drew names, and each one of us had the responsibility to make a present for the person whose name we drew. I have always remembered that. To this day, I love getting any type of gift that was homemade. My sister-in-law, Cherrie Thomas, has been the winner in my family the past several years giving gifts that are home prepared and memorable. Sometimes they take a little time, but I so appreciate the time and effort that she has put in to make that extra-meaningful gift. Here is a list that can give you some ideas. Also take the opportunity to ask people what the most memorable gift they ever received. In this process you may pick up an idea or two as well as open up some fun conversations. 1. CD of history of a family member: My father compiled a book of history of his ancestors before he died. I was fortunate to get his original copy. For my extended family this year, I am going to scan that book, put it on a CD and give each one of them a copy. 2. Memory letters: One year Cherrie contacted several of my friends and asked them to write a note about what they remember doing with me. She then put this into a notebook and gave me the notebook. What a special treasure this has been! I so enjoy going back and reading it. 3. Christmas tree ornaments: Add a personal ornament to the Christmas tree each year. Find a photo of the family that was taking during the year or at Christmastime around the tree. Make a Christmas tree ornament and give it to the family to add to their tree each year. This would be a wonderful gift for grandparents to give each year to their individual families. 4. Frame a treasured photo: Find a photo that is special to that person. It could be a family photo or one that you took with them in it. Frame and give them the photo. 5. German pancake meal: I had a lady stop me the other day and tell me that this was one of her favorites. If you live near the people you want to give a present to, invite them to your home for breakfast, lunch or dinner. Fix this recipe, which is good for any meal. German pancakes make a festive and memorable meal. Put milk, flour, eggs and salt into mixing bowl and mix with fork or wire whip. Melt 1 tablespoon butter or margarine in each of two 9-inch pie plates in an oven that has been preheated to 400° F. Butter should be sizzling. Swish butter around plate to grease bottom of pan. Increase oven temperature to 425° F. Pour batter into pie plate until ¼-inch thick. Bake 10 to 15 minutes or until golden brown. Edge will puff up, and each pancake will form a well in the center. 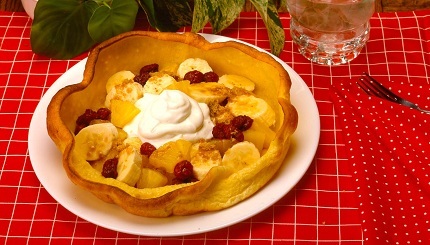 Spoon raspberries, pineapple and bananas into center of pancake. Sprinkle with brown sugar and top with sour cream or yogurt. Serves 4. Want to give a gift that will keep giving? Dian has shared her creative ideas for more than 30 years in the media and in books. She now has a special offer to save 60% on 5 books and 1 DVD. Get Dian’s creative library for only $40.00. You will never run out of ideas when you have this wonderful set of books. Take advantage of this limited offer at www.DianThomas.com.